National Flash-Fiction Day 2018 is nearly here. Author Ingrid JendrzejewskiPublished on 6 June 2018 30 November 2018 Leave a comment on National Flash-Fiction Day 2018 is nearly here. In case you don't know, this year National Flash-Fiction Day will be on 16th June. And, as ever, we have a range of things going on. The main launch for the day will once again be in Bristol, where there will be a Flash Walk, two workshops (one by Alison Powell and one by me, Calum Kerr) as well as the traditional reading event in the evening - to launch the new anthology Ripenings (right - available soon) - and the even more traditional visit to the pub afterwards. And there will also be a very interesting panel discussion on what competition judges are looking out for. So that's one not to miss. More details of all these are on the website. Other events include a Flash-Fiction Workshop and Reading in Gloucester, a panel on entering writing competitions and submitting to lit magazines.in Stoke, and the launch of Stephanie Hutton's first novella-in-flash Three Sisters of Stone. Details are also on the website. And, as ever. If you have an event we haven't listed, do let us know at nationalflashfictionday@gmail.com. As usual for NFFD, our journal FlashFlood will be opening it's gates for submissions. The blog journal provides a deluge of flash for the Day, and has now received over 409,000 views. Submissions open at midnight tonight, and then stay open for just 7 days. All the stories will appear on the 16th, available via the blog, or our Facebook and Twitter feeds. Stay tuned to http://flashfloodjournal.blogspot.com/ to find out more. And finally, on a more personal note, I have to announce that this will be my last National Flash-Fiction Day. I originally set the day up way back in 2012 and could never have imagined how it - and flash-fiction in the UK - would have blossomed. There are now many amazing flash things happening and I am so proud of the part that NFFD has played in it all. I have been helped across the years by many, many wonderful people - Tim Stevenson, Amy Mackelden, Kevlin Henney, the editors of FlashFlood, and too many others to mention. In the last few years, particularly, Santino Prinzi, has taken over much of the heavy lifting associated with NFFD and deserves all the medals. For me, though, it's time for me to move on and see what's next. The future of NFFD is currently undecided but we'll let you know as soon as we know what it is. So, that's it for now. Be sure to check out the website, the blogs, the social media, and have a great day on the 16th. Here's to another wonderful National Flash-Fiction Day. 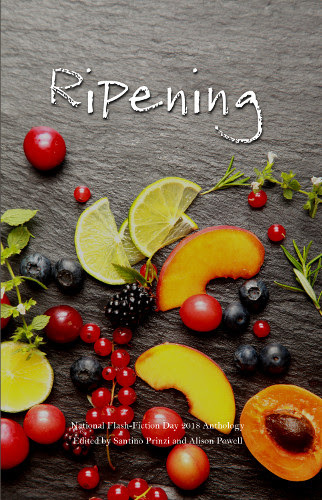 Previous article:Ripening: National Flash Fiction Day Anthology 2018 — Cover Reveal!